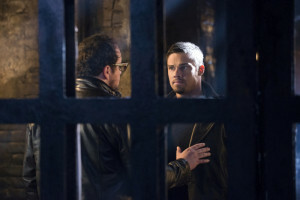 Tonight at 9PM (ET), The CW is showing their last Monday episode of Beauty and the Beast for a while, and the remaining six episodes have yet to be scheduled. 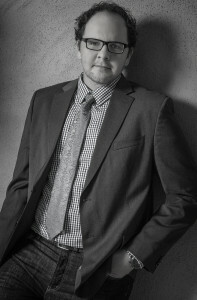 As we anticipate tonight’s show, we figured now is a good time to share more of our interview with Austin Basis, the man who plays J.T. Forbes who also happens to be “King Beastie” in the hearts of fans. Before starting with our interview, we asked Basis about the “King Beastie” name that he has inherited from fans on Twitter. Where did it come from? “I’m not quite sure,” he says. “I don’t think I named myself. That would be a little beyond my ego and my bravado. But I think I named someone ‘Queen Beastie’ because they were so active as a fan on Twitter… but then people were like ‘if she is the Beastie Queen, then you’re the Beastie King.’ I probably said ‘I only have room for one queen in my life and that’s my wife’,” he laughs. Thanks to Twitter, Basis has served as a bit of an ambassador between the show and the show’s very large online fan base. How and why did he get so involved? “I am an actor of the training where you try to think about things that the audience wouldn’t necessarily see, like backstory, what the character’s thinking, where he was just before this scene happened… so you try to create this world around the scene, so that it’s not just like you’re just an actor playing a part, and just doing the scenes, so that the character has a life around the scenes that links their world in a way that the audience may never see, but will hopefully see in your performance, and as part of that, I wanted to understand where they were thinking about going with the characters, where they thought the characters came from. Their upbringing, and how they met, what their relationship was like. Were they just med school roommates, and really friendly and stayed friends, or were they friends from the beginning?” he continues. “Sherri Cooper, who is the person that I spoke to in between the pilot and the second episode last season, before we came up to Toronto to film the series, she said ‘we don’t know how this is going to happen ultimately, but we’re thinking that J.T. is somehow responsible for Vincent becoming a Beast.’ As an actor, that is amazing. To me, that sets it up so perfectly, as an actor, to play every scene with that guilt that drives you to do that. Go a little further than you would as a normal, loyal friend, and as you see J.T. over the course of the 30 episodes beforehand, it was like that. You’d say ‘wow, he’s a really loyal friend,’ and then all of the sudden, they would be like ‘would you do that for your friend?’ I don’t know if I would do this. You have to create the circumstances in which you would, and guilt along with love are very strong driving forces to what people do in life. So, if you love someone, there are things you would do that don’t logically fit into what you would do in your life. They set up a perfect arc for me, and the question really, was just, only when it was going to come out. And if it never came out, I would always still have something driving me or helping me make choices of how far to go, as an actor, to play J.T. doing things for Vincent, whether it’s stealing blood, or breaking into the Morgue, or risking his life with Muirfield. So, the fact that it finally came out was good,” he says. Basis is aware that some fans are not happy with some of the “VinCat” drama but implores them to stick with it. “I respect the act of the full season, and the fact that for an episode or two, or three, there may be a conflict between Vincent and Catherine. They don’t have to kiss and make up at the end of every episode. It’s not a procedural; it’s a serial type of show where we’re telling a story over a period of 22 episodes. I just think that [they should] have confidence and trust that we’re telling the story of Beauty and the Beast — we’re not telling the story of Beauty and Gabe, or Beast and Beast, or Tori and Beast,” he says. As for romance for his own character… could things happen with Tess and J.T.? “I think if J.T. had his druthers, it would definitely be on, and frankly, Nina and I have fun doing our scenes, because they’re filled with jokes and great little moments, and I think that ultimately, there’s a definite relationship. Whether it’s for the long haul, or whether it’ll be consummated this season… I think they’re headed that way. J.T. is all in, and we’ll just have to see if Tess reciprocates the feelings,” he teases. 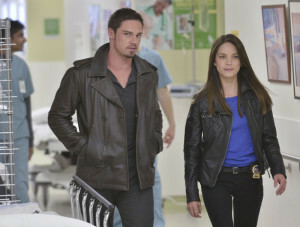 Beauty And The Beast is new tonight (March 10) at 9PM ET on The CW.